This is the picture shown in Update 2, and which is included in Royal Mail's sales magazine, Collections. And this is a scan of the actual sheetlet and the actual pack. 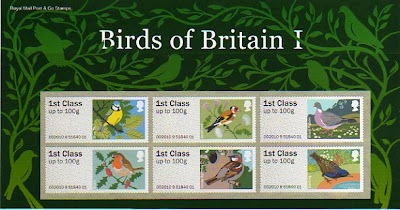 I suspect that the official Bureau FDCs will have the stamps arranged in the same sequence. We've been told that Royal Mail have a 'gallery' of images to use in publicity, and that they release these to the trade and their own agencies as necessary. OK, if time and deadlines are pressing, then I can understand why they might use artists mock-ups until the actual final designs have been agreed, and until the actual stamps are printed. It would be much more helpful to everybody if they used images of the actual articles when they get them? (And there's no need to check what is on the Royal Mail stamps website, because they aren't mentioned.) These labels must have been printed before Collections was put together for printing? It sort of reminds you of Spanish hotels in 1970s brochures - what they show is an artist's impression! It's going to be a Cracking Christmas, Gromit! Birds have arrived in Norwich! Non-perforated Golden Horizons going national?